The roster startlist of riders has not yet been announced, certainly after yesterday, there will be changes after Fabian Cancellara's sad fall and injury during the Tour of Flanders. At least will finally know the parcours for the race, and I am so happy to see the Arenberg Forest officially on the map. It is labeled as climb 16. 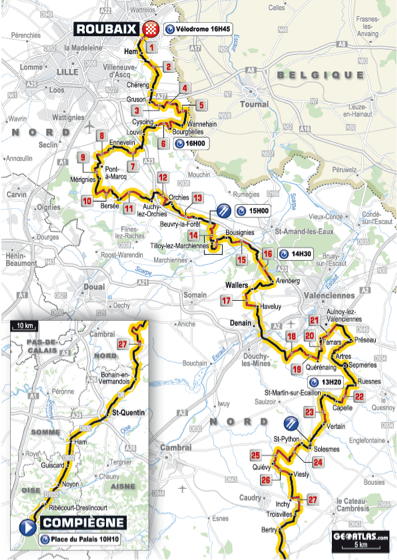 That is exactly where we plan to be on the day - the Arenberg. After what could have been the best day ever as a fan of cycling, I hope attending Paris-Roubaix as a fan will be close to as fantastic as the Tour of Flanders was yesterday. If it is it will be icing on the cake. Yesterday was worth every minute of planning, every hour of travel, every instant of anticipation. I am in love with Belgian cycling. For anyone dreaming of coming to a race in Belgium - just do it! You will be blown away.